And yet, strangely, it is. Sure, it’s not in the same league as the genre-defining 1988 original nor quite the ultra-violent thrill-ride of the first two follow-ups. But if you can get past that, Die Hard 4.0 (which went under the even sillier moniker of Live Free or Die Hard in the States) is an over-the-top, fantastically funny action extravaganza that is guaranteed to have you sauntering out of the cinema with a mile-wide grin plastered on your face. Against all odds this could be the pick of the 2007 summer blockbusters. The set-up lacks the simple, nerve-shredding claustrophobia that made the original so great; but then the whole building-under-siege scenario could only ever really work once. Instead, Die Hard 4.0 opens up the action arena to take in an apartment block, the freeway and beyond, as it moves from one destructive set piece to another. In fact the movie moves so fast and so loudly that director Len Wiseman and screenwriter Mark Bomback are obviously hoping that no one notices how flimsy their 24-lite story actually is – a technique that, for the most part, succeeds admirably. 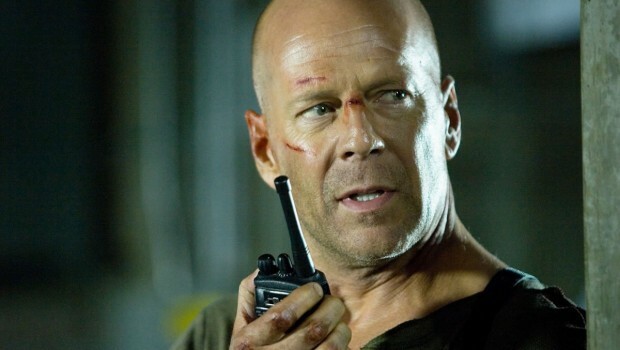 It doesn’t matter that Willis’ McClane is now in his fifties, either. In fact, that’s kind of the point. McClane is seen as a man of outdated methods, a relic who can’t comprehend a word of the cyber-terrorists’ techno-babble and can barely even work a computer. Even fighting has moved on since McClane’s glory days – “damn hamster” he rasps incredulously as watches one baddie (played by French star Cyril Raffaeli) perform some in vogue parkour before his eyes. But, of course, it is McClane who has the last laugh. Like the similarly middle-aged Jackie Chan in New Police Story, the New York cop is here saddled with a younger sidekick, a computer hacker by the name of Matt Farrell (played by an initially irritating and eventually amusing Justin Long). Farrell mostly stays away from the fighting, instead concentrating on all the computery stuff and quipping “did you see that?” a lot while McClane lays waste to bad guys in various inventive ways. Together they make for an improbably winning double act. In keeping with McClane’s old-school tactics, Die Hard 4.0 is being billed as the only blockbuster this year that doesn’t rely on CGI for its spectacle. And what spectacle it is. Taking in such head-spinning sights as an apartment-set gun battle, a car-dangling-down-a-lift-shaft sequence (reminiscent of the car-dangling-down-a-cliff-face sequence in The Lost World – but better) and a truly jaw-snapping McClane Vs Stealth Fighter showdown, this movie contains some of the best action stunts ever seen on film. It’s also action with a sense of fun; Wiseman knows exactly how long he can stretch an action sequence and still maintain the excitement factor – in stark contrast to the recent numbing non-stop spectacle of Pirates of the Caribbean: At World’s End. Wiseman thankfully resists the temptation to over-stylise events with the hyper-kinetic edits of most contemporary actioners; if you’ve written off Wiseman as a hack director after the Underworld movies, Die Hard 4.0 reveals a previously hidden flair for inventive action. Crucially, it’s an action movie that also places an importance on character. Willis has a rare gift for combining tough guy heroics with deadpan, self-deprecating comedy – as you start watching McClane in action you realise how much you’ve actually missed the guy. His athletic tumbles and well-timed quips impress just as much now as they did 19 years ago – even if the last minute shoe-horning in of his signature line is one step too far. Die Hard 4.0 is completely ridiculous and completely over-the-top – in other words, exactly what you want from an actioner. It has its flaws; there’s a brief sag in the middle section, its bad guys are less memorable than in previous instalments and the movie is frustratingly profanity-free for a Die Hard movie (a concession to secure a PG-13 rating in the States). But for dizzying spectacle married to a witty, quasi-intelligent script, it’s certainly hard to beat. Welcome to the party, pal. The double disc DVD includes a reasonably informative commentary from Wiseman, Willis and editor Nicolas De Toth; a jokey (though not very funny) featurette with Justin Long wandering around the set; a typical step-by-step making of feature; two dry featurettes on real-life cyber crime; and an odd, though occasionally revealing, “conversation” between Bruce Willis and Kevin Smith as they sit awkwardly on some steps.